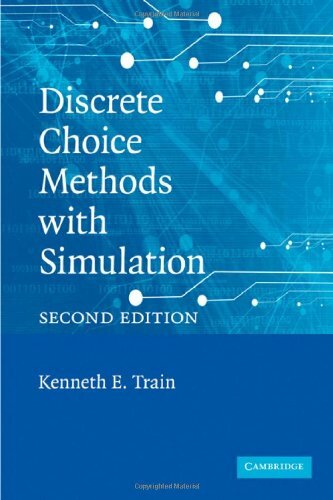 Simulation methods have unshackled discrete choice analysis, breaking down the computational barriers to use of plausible, interpretable models. Kenneth Train provides an excellent road map for both econometric specialists and practitioners through this comprehensive, readable treatment that pulls together the research literature and provides many new and useful results. This text provides an introduction to spatial econometrics as well as a set of MATLAB functions that implement a host of spatial econometric estimation methods. The intended audience is faculty and students involved in modeling spatial data sets. Chapters: Cost, Revenue, and Profit Functions; Symmetric Duality and Polar Production Functions; Applications of Profit Functions; General Linear Profit Function; Duality, Intermediate Inputs and Value-Added; Hick's Aggregation Theorem; etc. This book presents an attempt at unifying certain aspects of econometric theory by embedding them in a more general statistical framework. The unifying feature is the use of a priori information and the basic tool is the Cramer-Rao inequality. This is a step-by-step guide to financial econometrics using EViews 6.0 statistical package. It contains brief overviews of econometric concepts, models and data analysis techniques followed by examples of how they can be implemented in EViews.